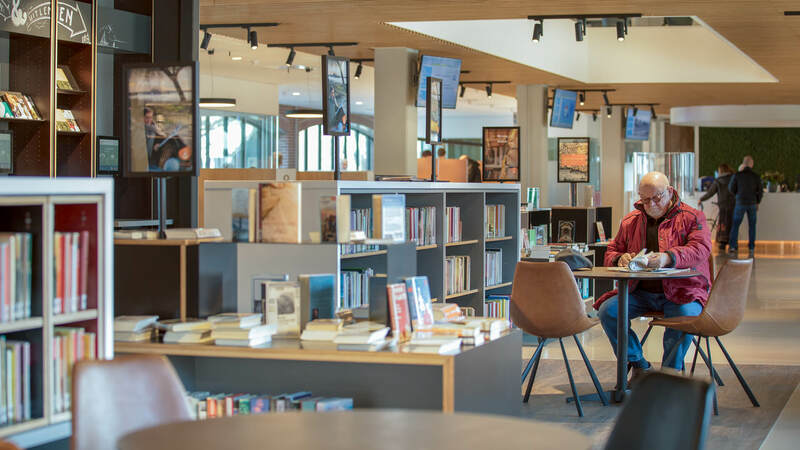 The library of Harderwijk had to move to a new, smaller location in town. Since the library had to give up some of its square area in terms of quantity, it was time to add and condense quality. We made way for active programming: debating, reading, playing, and creating. The Harderwijk library moved to the Town Hall, and is now based at the ‘plaza’ where several public functions are combined. It’s called the ‘Huis van de Stad’ – the House of the Town. As time was limited due to political and administration reasons, I turned to the Library Design Workshop Way of Working to create an interior design. We dove into the core of the organization, and ever so important: we focused on the profile of the users and their needs. This introspection was made possible by intensive classes for the library team members that focused on the Why (inspired by author Simon Sinek). We dove into the core of the organization, and ever so important: we focused on the profile of the users and their needs. 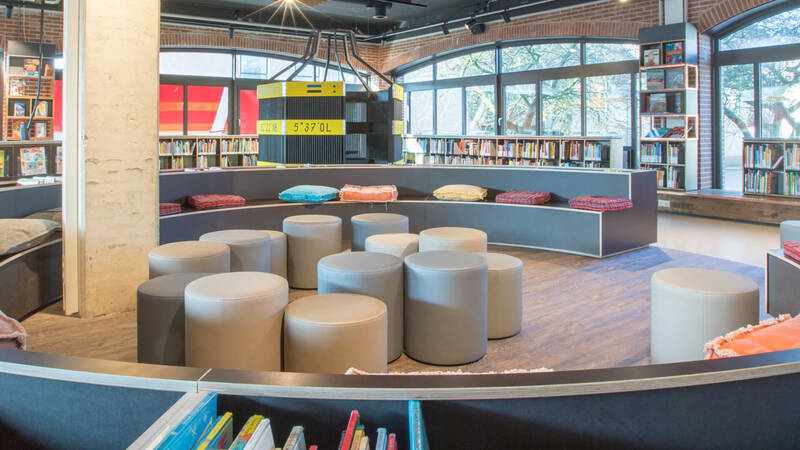 The team was unanimous about their vision for the library’s core: there should be room for debate and discussion, reading and learning, playing, doing and making. There should also be plenty of opportunities for studying and consuming knowledge, and of course having a bite to eat and a drink. 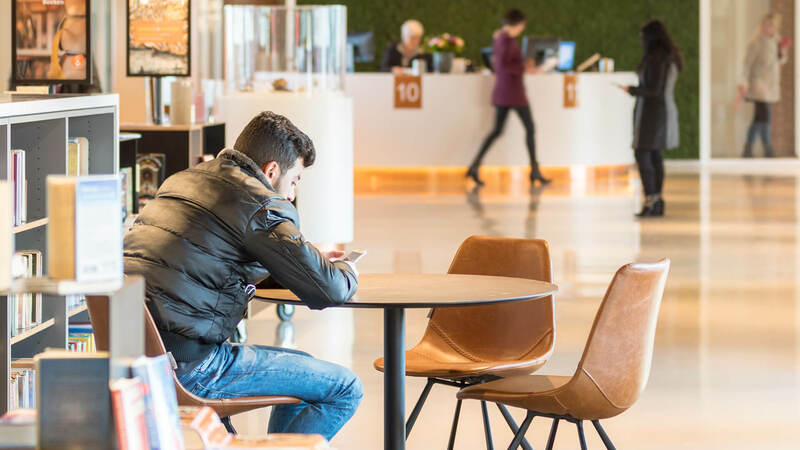 People should be able to work at the library, and also stay there for recreational purposes. 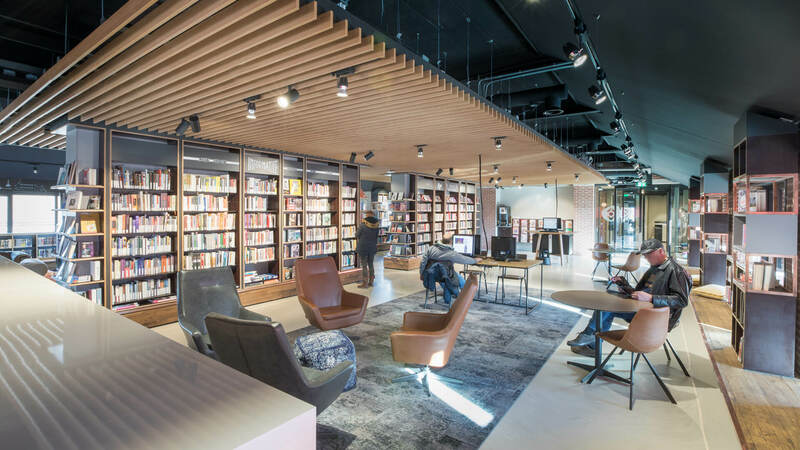 The client consultation shaped the library’s interior: small-scale, with plenty of room for education, and with a great welcoming atmosphere. The library was to play an important role for education but also a significant role for culture. 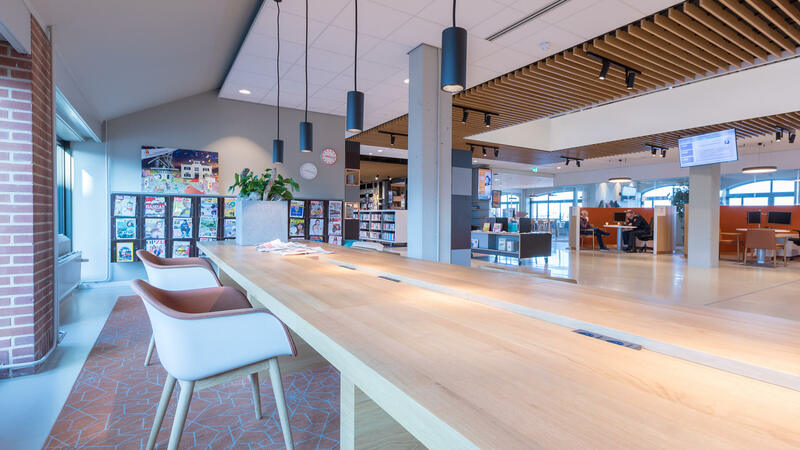 User investigation was done by the library, showing that especially kids between 0-12, youth, families with young children and students find their way to the Harderwijk Library. Friendly hosts are available on the floor; special attention is needed for the elderly and the local connection with peers. With all these curious minds coming together, language education also occupies an important place in the new library. 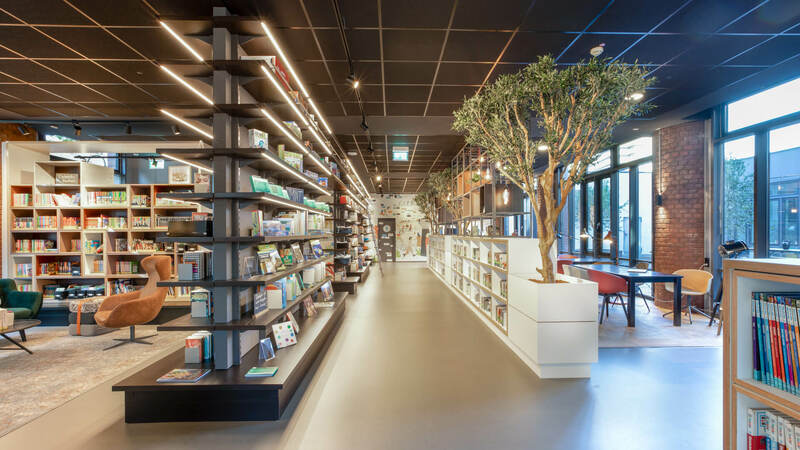 A dynamic media setup is now found in Harderwijk; a combination of books and new media in varied compositions. There is plenty of room for education. Think of classrooms, computers, workplaces, study spaces, and quiet zones. Wooden elements added warmth to this ‘Huis van de Stad’ which now breathes a welcoming atmosphere. The fresh and colorful interior is small-scale and offers corners with an ambience of their own, with large sofas and cozy seats. 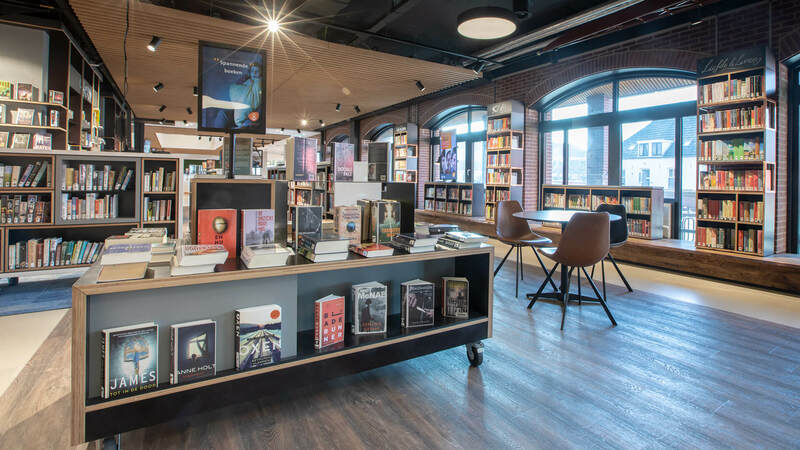 The space is open, light, transparent, flexible (thanks to the mobile book racks that can be rearranged as desired) and has playful different heights in the ceiling with wooden laminations. 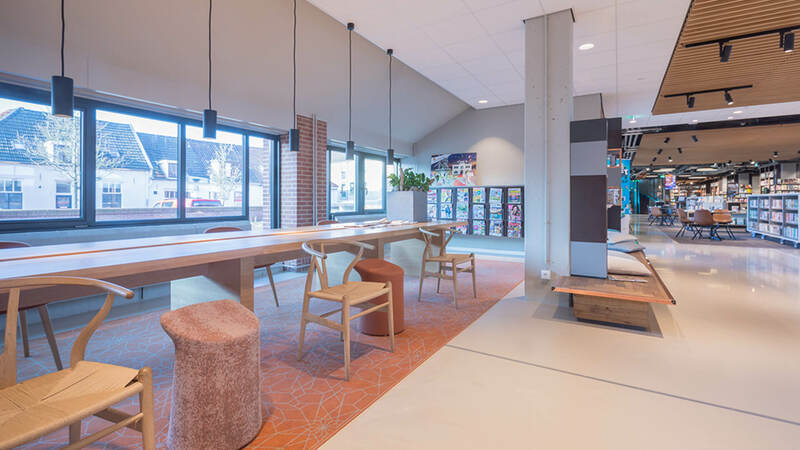 Thanks to its uncomplicated and inviting character, the space functions as a living room for the citizens of Harderwijk to wander among the various media, places, and facilities. 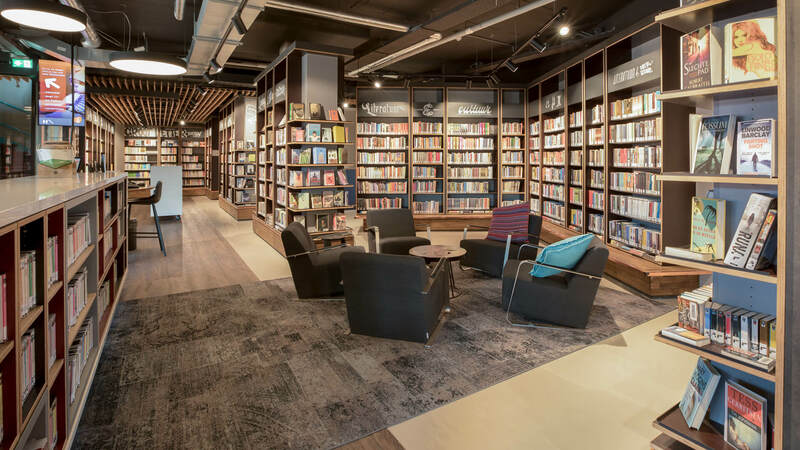 Despite having compromised its size, its cozy character and openness invite visitors to stay longer, sip on a soft drink or coffee at the long reading tables, and get lost in a good book or magazine. 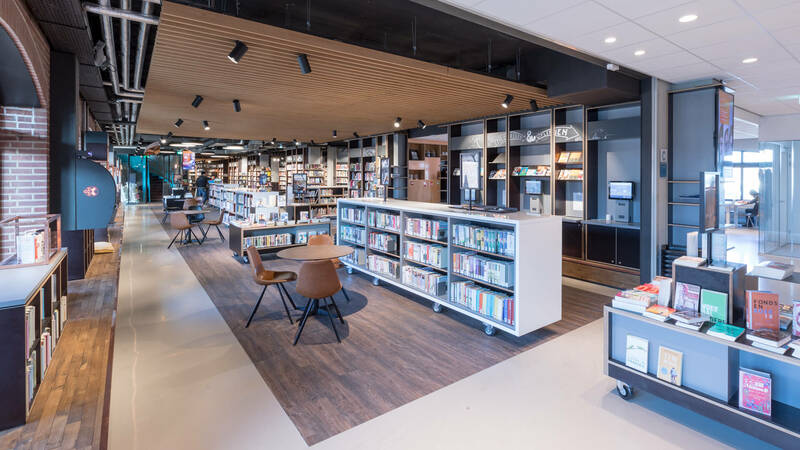 Harderwijk Library is a co-creation of aatvos (design) and Stonepark InteriorBuilders BV (detailed design and production).